Professor McGee is Dean of the Faculty of Medicine and Health Sciences, at the Royal College of Surgeons in Ireland (RCSI). She joined the RCSI in 1987 as a Health Psychology Research Fellow. In 1997 she became Professor of Psychology and in 2006 she became the first Head of Population Health Sciences (PHS) at RCSI. 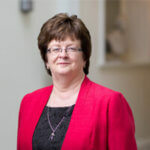 She established RCSI’s College-wide Research Ethics Committee in 1998 and in 2009 became Deputy Director of Research. Professor McGee’s research interests are in quality of life assessment and epidemiological and psychosocial aspects of ageing, cardiovascular disease and sexual health. Her current role is as chief academic officer for RCSI’s degree awarding programmes – incorporating Dublin, Bahrain, Dubai and Malaysia. She has served as president of the Psychological Society of Ireland and the European Health Psychology Society and as Chair of the Rehabilitation Committee of the European Association for Cardiovascular Prevention and Rehabilitation. She chaired the Department of Health’s expert group to develop the National Policy on Cardiovascular Health (2010–2019). Currently she serves on the Oversight Board of TILDA (the Irish longitudinal Ageing Study) and on the Council of the Economic and Social Research Institute. Professor McGee graduated from Trinity College with a degree in Psychology in 1981, and a PhD in Psychology in 1988. She was awarded a DSc (NUI) for her research portfolio in 2015.